Leendert van der Pool, born in the Netherlands (1945), spent fifteen years in the Dutch merchant marine, working on freighters, coasters and salvage ships. His early artwork (1976-1990) reflects the influences of his years at sea, both in subject and in mood. 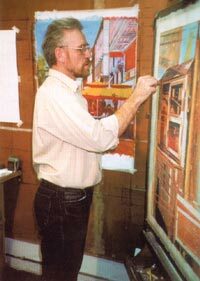 After visiting the United States several times in the early 1990’s and moving to New York in 1994, Leendert devoted several years to creating a series of large-scale, intensely colored pastel paintings based on Ellis Island, the New York immigration station. Ellis Island served new arrivals to the United States during the late nineteenth and early twentieth century and is now a museum of immigration. The theme of these pastels is the experiences of the immigrants and the museum itself. A self-taught artist specializing in drawings, pastels and oil paintings, Leendert has exhibited his work widely in museums and galleries in Europe since the late 1970’s, and, more recently, in the United States, with recent shows of the Ellis Island series at the Ellis Island Museum the Franklin 54 Gallery in New York City. His drawings have been included in numerous books as well as several museum collections. Recent group shows have included exhibitions in Shanghai, Taiwan and Paris. Leendert is a member of the Pastel Society of America and the Salmagundi Club in New York, and has received numerous prizes for his artwork, including the first prize at the Pastel Society of America 30th Annual Exhibition. Currently, Leendert is working on a series of oil paintings of Paris storefronts, and landscapes of the French countryside. Other projects have included a large series of drawings, paintings and lithographs of the historical printing company, Mourlot Imprimerie, and “Boulangerie-Patisserie,” paintings based on a traditional French bakery. A travel grant awarded in 2001 allowed Leendert to spend two months in Eastern Europe. The results are a series of 75 watercolor paintings of village and farm architecture and scenes of small town life in Poland, Lithuania and the Czech Republic. Leendert van der Pool is an Adjunct Associate Professor of Art at Long Island University in New York City. He teaches workshops in color theory and drawing in the United States and Europe and spent a month in Japan during 2000 and again in 2005 as a guest instructor of the Japan Calligraphy Network, teaching color theory. He lives six months of the year in New York City and six months in Paris. On September 22, 2010, Queen Beatrix of the Netherlands responded positively to our request. 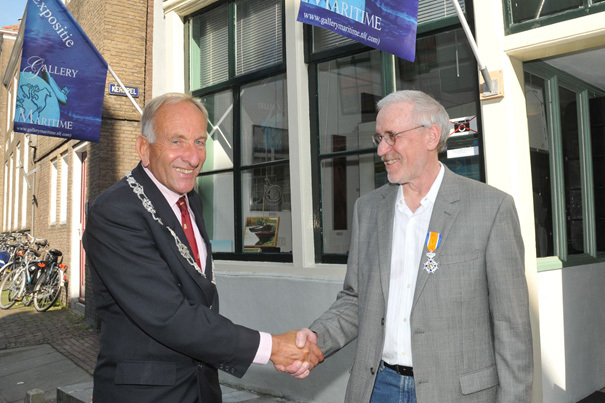 Leendert van der Pool received the official nomination of Knight of Oranje Nassau. Leendert is the first artist in Zeeland who has this title.